Bringing a genre to the mainstream isn’t easy. While you have all the underground fans of a style that may follow you to a major record deal, sometimes the folks listening to stuff against the mainstream resent those that try to take their unpopular nugget and turn it into something huge. Today’s band not only managed to make it, but has sold over 60 million albums in 15 years. Agoura Hills, Calif. is known for some major things (Green Bay Packers’ star linebacker Clay Matthews as example) but perhaps one of the biggest is trio of guys that went to high school in the L.A. suburb. Immediately after graduation, the three formed a band and recruited others to help perform locally. Going from a group of three to six created tension as the band failed to find their groove and land a deal. Two of the added members left, including the lead singer. The band turned to the vice president of a small label for help. He recommended reaching out to Chester Bennington, an Arizona guy who’d made some waves in his own grunge band. It was clear he was a great fit from day one and the band took a huge step forward. After a guerilla-style marketing campaign generating buzz from a small EP they released, the band still struggled to find a deal. They went back to that same small label mentor, and it just so happened he was now the VP of Warner Bros. Records. He immediately signed them to release an album—a debut album that would go on to sell nearly 30 million copies. 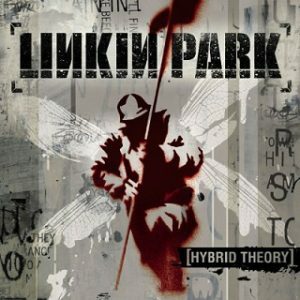 Linkin Park released Hybrid Theory in October of 2000. The album was originally self-titled but the band changed their name to pay homage to Santa Monica’s Lincoln Park. The spelling change occurred when the band went to acquire the internet domain name, and linkinpark.com was all that was available. While the tracks are credited as being written by the whole band, most of them come from Bennington’s personal experiences and issues. In a way, this was a great transition from grunge, as it dealt with many of the same themes: drug/alcohol abuse, broken home, isolation, disappointments and failed relationships. The biggest change however, was the format in which those themes were parlayed. Officially labeled as nu metal, you also hear rap metal or alt metal as genre descriptions. It’s heavy rock, with a totally different take on vocals. You get Bennington’s classic hard rock voice and the backup singer doing a Roots style rap. It was so unique to the mainstream; Linkin Park often gets credit for creating the category. From a personal take, I don’t think I listened to this too much when it came out. It took me probably a year to truly catch on to the band, and from there, it became a staple at the time. Being a big fan of hard rock, alt rock and hip hop, this album was a great blend of each style–and it was done so well, it was hard to argue against the blending. Sure, some tracks may not be amazing, but for the most part, this album is a great listen. Some critics were hard on the album, saying it was trying too hard to please everyone, and it was really for nobody. Clearly those guys were wrong, because the band laughed all the way to the bank. And not every high-selling album is historic, but this one is, and it’s really good. Linkin Park is working on their seventh studio album, due out sometime this year. I can’t say I’ve kept up too much with the band, but this is very worth going back to. Hopefully you have a spare fiver in your nu metal budget this week—you won’t regret spending it. I completely understand your view. Since this album (and even some on the tracks on it) – they have a few songs I really enjoy, and then I listen to the rest of the album and it’s very underwhelming. They’re one of those bands that maybe is a bit inconsistent in their quality. Thanks for the comment!